This post was originally published on December 20, 2014 and republished on November 16, 2017 with updated content and pictures. A few years ago, my family and I were visiting beautiful Sorrento, located in the Campania region in Southern Italy. As we were wandering through the busy streets, we stumbled – literally stumbled – upon a lemon and orange grove smack in the city center (we also “stumbled” upon Pierce Brosnan, but that’s another story). As we began our short stroll on this path, the sounds of the hustle and bustle of the streets of Sorrento, scooters and all, faded into a distant hum. Unexpectedly and instantly, the environment became peaceful and relaxing. We walked into a garden whose existence came into being over 200 years ago. 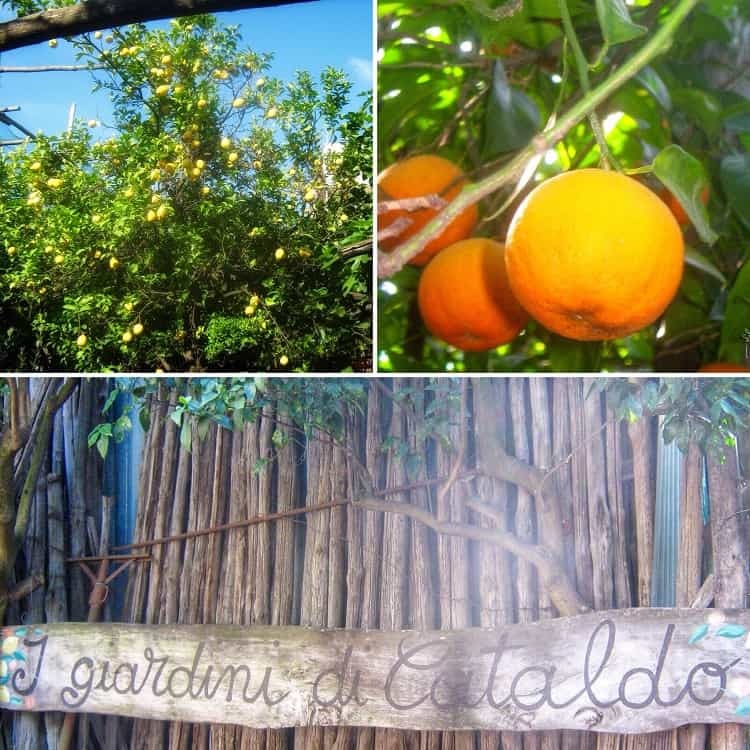 This garden is called “I Giardini di Cataldo“. At the end of this short journey, there was a stand, where one could purchase and sample homemade marmalade, ice creams, and different flavored liqueurs such as fennel, licorice, basil and of course, limoncello. 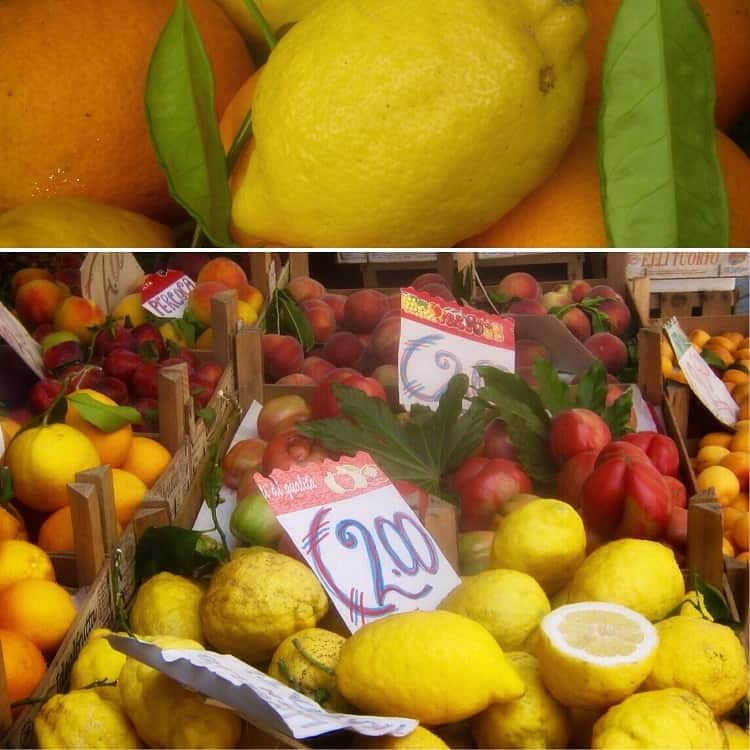 It has often been said that when life gives you lemons, make lemonade – except in the region of Sorrento where they make Limoncello. If you are not Italian, or have never visited Sorrento, you might not be familiar with this Italian liqueur. a wonderful ingredient to use in Italian desserts. If interested, you can read about the history of limoncello by following this link. Are you ready to make this Italian Limoncello? 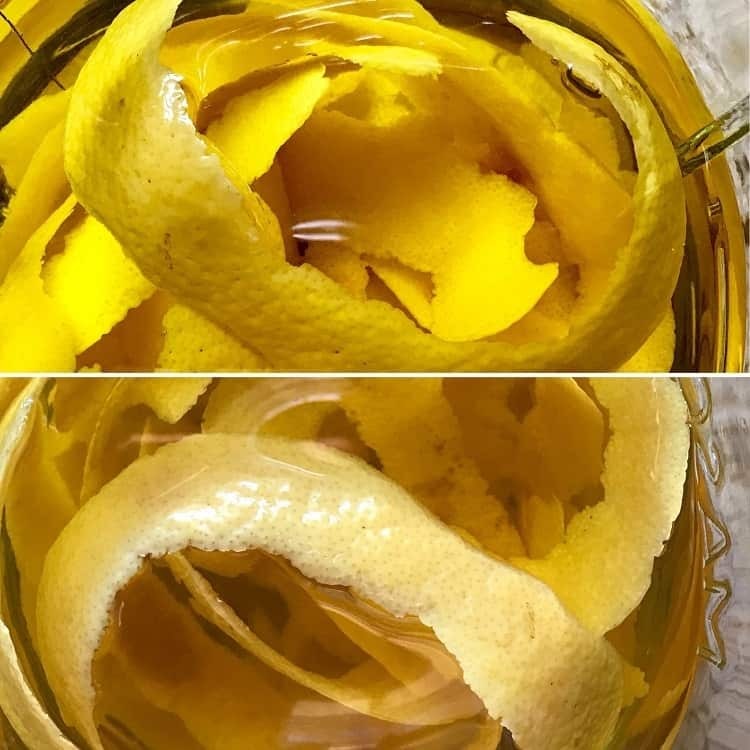 This simple process begins by infusing a grain alcohol with lemon peel. Thoroughly wash, scrub and dry your lemons (preferably unblemished and unwaxed) before stripping them of their peel. Unfortunately, I do not have lemons growing in my backyard so I use organic lemons. Make sure you remove the pith (the white part) of the lemon, lest your limoncello be bitter. Next, the lemon peels need to steep in alcohol. Use a high grain alcohol and a glass jar with a tight-fitting lid. Mason jars are great as the tight seal provided by the screw tops will prevent evaporation of the alcohol. The infusion time can last anywhere from 6 to 40 days (or even longer) in a cool, dark place. A longer steeping period will result in a better tasting and better looking limoncello. Swirl contents of jar twice a day. You will notice that this process will strip the lemon peels of their color. When ready to proceed to the next step, strain the liquid with a cheesecloth in a clean bottle. Sugar is required to make the simple syrup which is in turn added to the infused alcohol. 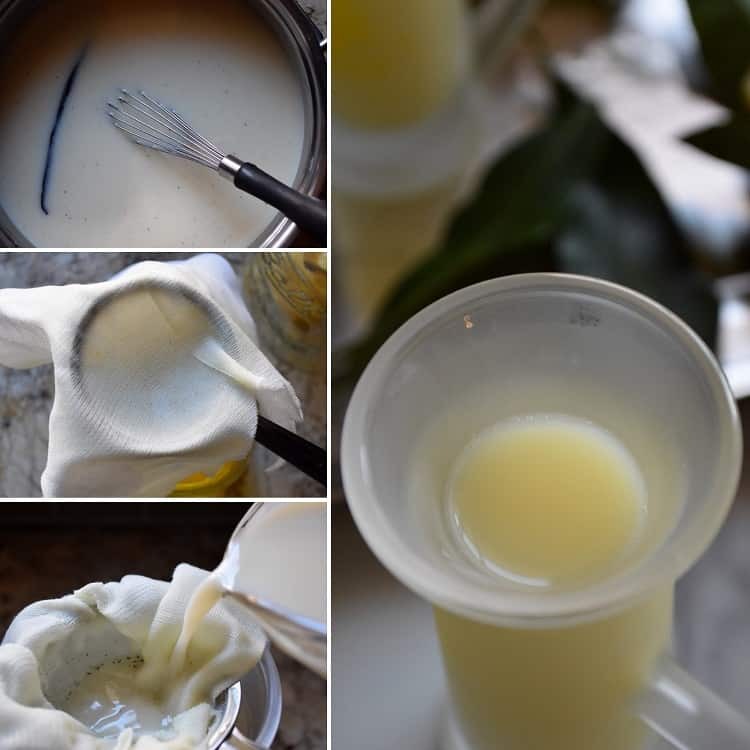 When you make the simple syrup with milk, you will obtain a creamy limoncello. The addition of a vanilla bean will enhance the final taste of this liquor. Warm the simple syrup (the sugar, milk and vanilla bean) over medium low heat and whisk together. Once the sugar has dissolved, strain the mixture with a cheesecloth in a large clean bottle. You might have to strain the solution a few times to get all the vanilla seeds. It is very important to allow the sugar solution to cool down to room temperature before adding it to the lemon infused alcohol. We do not want the limoncello to curdle. The final step in this process is combining the lemon infused alcohol with the creamy syrup. The Limoncello can be refrigerated for up to 1 month or frozen for up to 6 months. If freezing, allow sufficient head space of a few inches for the Limoncello to expand. wonderful ingredient in baking or cooking. I will use the lemon juice (from the leftover lemons) to make my Lemon Loaf (link below), and then drizzle it with some Limoncello. When a friend of mine, Vittoria, learned of my new found appreciation of this lemon liqueur, she shared her recipe with me. Vittoria is originally from Petrella, in the province of Campobasso, in the Italian region of Molise and had been making limoncello all her adult life. I compared different “recipes” for creamy limoncello and I came to the conclusion that once again, the best one is simply a question of taste and how sweet you want your limoncello to be. 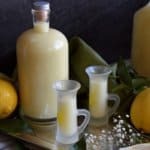 I have been making and serving this recipe for Crema di Limoncello di Vittoria for a few years and it is always appreciated by family and friends. The only modification I made was to replace 2 tablespoons of clear vanilla extract with a vanilla bean. 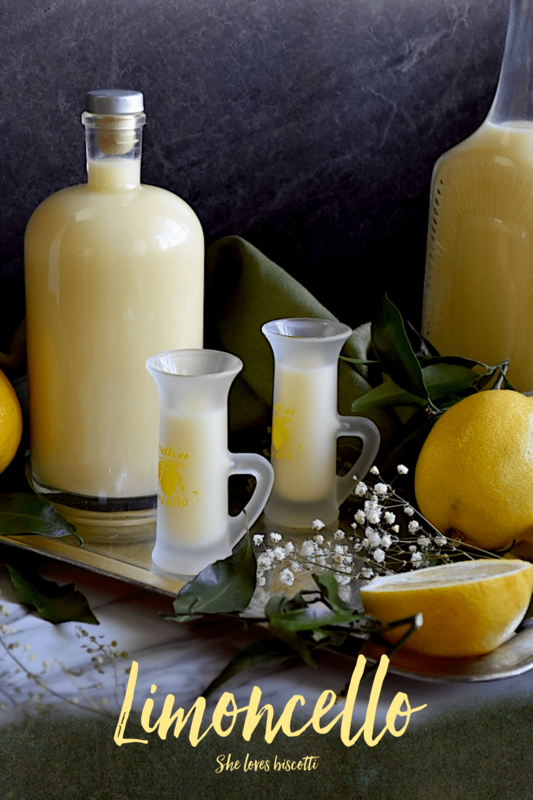 This wonderfully refreshing creamy lemon liqueur can be enjoyed year-round. I like to make a batch just in time for gift giving for Christmas. You can easily make a batch of Crema di Limoncello di Vittoria this week-end and it will be ready for you to bring in the New Year! ★★★★★ If you have made this Crema di Limoncello recipe, I would love to hear about it in the comments below and be sure to rate the recipe! Thoroughly wash the lemons (preferably organic). With the use of a vegetable or potato peeler, remove lemon peel (avoid the white pith as this will make your limoncello bitter). Place lemon peel in a mason jar (or other container with a tight-fitting lid). Add alcohol, close tightly, and let steep for at least 6 days or up to 40 days in a cool dark place. Swirl contents of jar twice a day. Remove lemon zest (should be a pale color- the alcohol on the other hand should be a bright yellow). Strain with a cheesecloth in a clean bottle. In a large saucepan, over medium- low heat, warm the milk, sugar and vanilla bean. Whisk frequently until the sugar is dissolved. Remove from heat and allow to cool to room temperature before adding to alcohol. Strain (with the help of a cheesecloth) in decanter with alcohol. The longer the period of infusion, the better the final product will be. Minimally, infusion should be at least 6 days. I like to use UHT 2% milk. Can be refrigerated for up to 1 month or frozen for up to 6 months. Allow sufficient head space of a few inches for the Limoncello to expand. Just bottled some. It tastes great but it has curdled/separated. I let the syrup cool on the stovetop but maybe not for long enough? It’s in the fridge now. I’ll check it in the morning. I used whole organic milk and less sugar with an Everclear base. I’m sorry to hear this. Let me see if I can help. There are only 2 things that come to mind…Was the syrup at room temperature? If not this may be a cause of curdling. The right proportions of sugar and alcohol are required for the mixture to work. Just wondering how much is “less” sugar? will wait for you to respond and take it from there. Thanks for the feedback, appreciate it. I did put mine back in the fridge when I added the syrup and it looks like it may have separated.. not curdled. I am going to us the emulsion blender and see if that works. Hi Mary, not really sure why the mixture separated… just wondering what results you got from using the emulsion blender? Thanks in advance. Hi! I just completed my first batch and it was a hit! I had a little trouble with curdling though…I allowed the simple syrup to cool completely. I put both the simple syrup and the alcohol in the fridge after straining for a few hours and I still got a little curdling. I strained most of it out but you can still see it on the glass when you drink it. Any trouble shooting suggestions for next time? It still tastes amazing but isn’t as smooth as I hoped it would be. Thanks for the fantastic recipe! I just made seveal batches and used SO Dairy Free organic French vanilla coconut milk non diary creamer – no curdling – tastes wonderful. I made one with Horizon organize half and half and there was a bit of curdling, very small. Silk Almond Creamer turned out well too! I used honey instead of simple syrup and I put the vanilla bean in with the peels and Grain alcohol. I also put the lemon juice in from the lemons when I let the peels sit for 32 days. It will be interesting to see if I get separation or how it tastes after being in the fridge for ten days. Tatar’s pretty good this morning. How wonderful J! Great information for anyone that wants to try with organic coconut milk. Thanks so much for taking the time to comment, appreciate it. Can heavy cream be substituted for the milk? That is a great question Lillian. I have checked with a few of my friends who make Limoncello on a monthly basis and none have tried with cream. Perhaps there is someone that will comment on your question. My husband and I bottled this DELICIOUS version of limoncello last night! We have never had a creamy version before, and this one is outstanding! Thank you so much for sharing this recipe with us. We can’t wait to give out as Christmas gifts to our neighbours and friends…we made a triple batch and so happy we did! Have you ever used almond milk in this recipe? I’ve made your delicious limoncello a number of times with milk and absolutely love it, as do my family and friends. I fell in love with Lemoncello in Rome in 1994 & I brought back both the Creamy & Non-creamy. I always have Lemoncello’s in my fridge.😉 Now that I have your recipe’s I am definately going to make my own! Thank You so much for sharing. 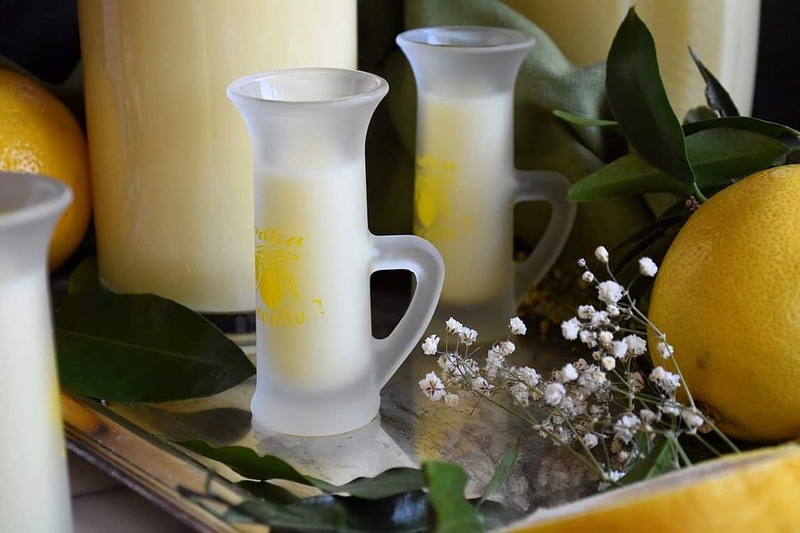 I know you’ve been asked about your beautiful little Lemoncello glasses & wonder if you ever found out the manufacturer or store that carries them? Also, I love your glass bottles with the corks in them & the other decorative one too. Would you please let me know where I can get the bottles too please. 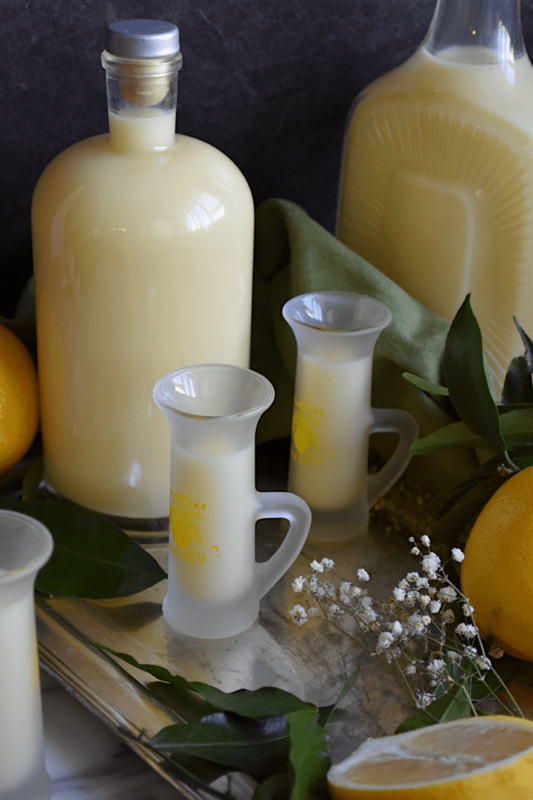 I want to make Lemoncello Gifts too! This is how I would calculate it… this recipe will make about 2 Liters. (the yield is 65 servings and each serving is 30mL). 2 Liters is roughly 65 ounces. So, you mention that you have 8 ounce bottles; therefore one batch of this recipe will be enough to fill 8.2 bottles. If everyone of your guests is receiving a limoncello party favor, you will need ingredients to make the recipe 10x. Another way to calculate is that if you have 80 bottles of 8 ounces to fill up, you need 640 ounces. This recipe yields a little more than 65 ounces. So if you multiply the recipe by 10, you will get 650 ounces, enough to fill your 80 bottles. Hi Maria, just made my first batch of Lemoncelo and all I can say is WOW! It is amazing. I only infused the lemon peels for 3 weeks but still have a lot of flavor. Had quite a time straining out all the vanilla been center, just telling everyone what those little dark spots are and they are impressed. I used whole milk and there’s a bit of cream on the top, not really a problem. Will take it down to the 2% as you suggested next time. These are going to be given away in beautiful decanters tomorrow for Easter. Thank you for sharing your recipe and on a side note, I would be interested in those cute little Lemoncello glasses as well. I am on my 3rd year of making Limoncello in the USA and use organic lemons and have tried lots of options in alcohol but find I prefer a high grade vodka. I let the lemon zest sit for 80 days in it and add my simple syrup and it’s ready to bottle. But as I give these away as Christmas gifts I, too, have search and searched for glasses just like yours to no avail. Any chance you could contact the store in Montreal and let me know the name so I can purchase some?? Can I ask where I could find the strong grain alcohol? The recipe sounds wonderful. Thank you for sharing. I want to hear our Pierce Brosnan story!! Also, I’ve never tried crema di limoncello, but I love all things lemon so this is something that I would probably enjoy. Thanks for sharing! How spectacular is this! I have enjoyed Limoncello before but this cream version sounds absolutely amazing. I think it might have to be my next project. Being a huge lover of lemons I could see myself using this in various applications. Great looking crema di limoncello you have here, Maria! I’d so love to have a sip 😉 . Never made my own, Loreto wanted to try, and he will. For now, we buy limoncello every summer we go back to Italy. I’ll tell him to follow your recipe, we just have to find “worthy” lemons (and it’s not that easy). We also make Lemoncello at Casa Levitt, however not the Crema variety. With a prolefic lemon tree in our garden, it would be a shame not to take advantage. It absolutely does make a wonderful gift – next season, we will try your recipe. I would love to make crema di limoncello, but every recepie that I have found include very strong alcohol (90-95%). I live in Sweden and we can’t buy stronger alcohol than approx. 40% here. Do you know if I can use lower alcohol? Ever since a trip to Italy a few years back, I’ve been making my own limoncello. I just fell in love with it! This past Christmas we spent some time in Rome and my brother-in-law also fell in love with limoncello. I can’t wait to try your creamy version! Can you tell me where you got the glasses? I looked all over Rome for glasses, online once we got home and in many local stores. I’d love to give my brother-in-law some “official” limocello glasses, so if you could point me in the right direction, i’d be so appreciative. Hi! I also love limoncello!Hope you enjoy the creamy version! I purchased the glasses from a local retailer in Montreal(Canada)who imports from Italy. Have you tried e-bay? Also, if ever you’re visiting big cities (New York, Boston, Toronto,etc), there is always a “little Italy” area…I am sure you would be able to find a store which imports, just like I did here in Montreal. Another suggestion…if there is an “Italian” restaurant in your area and they have the glasses you are looking for, ask to speak with the manager…who knows…you might be able to purchase them… Good luck and thanks for your comment! I have been making my own for quite a while, i try differnt flavors as well, blackberry, lemon lime with vanilla bean. I got my glasses like the ones in the picture In Sorrento Italy there is a limencello factory, I got mine there!